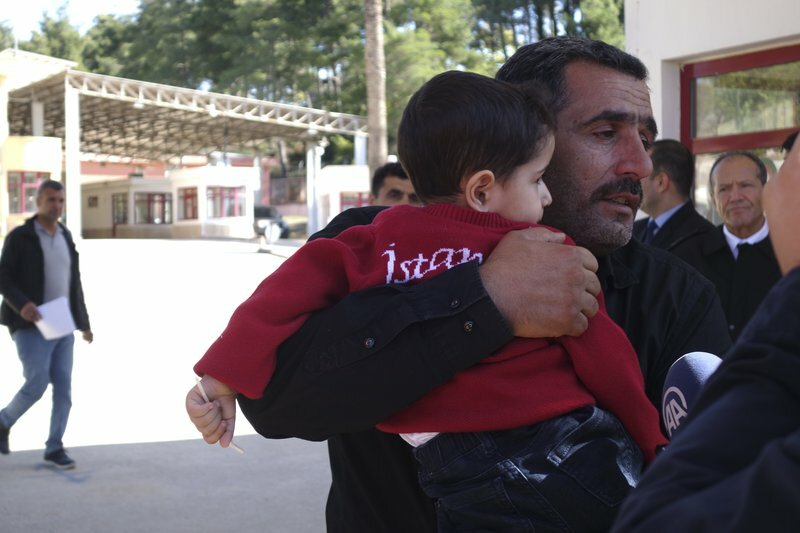 Two-year-old Reda with his father, Abo, were reunited by the Syrian Arab Red Crescent and the Turkish Red Crescent Society as part of the Restoring Family Links programme. A man runs toward Red Cross and Red Crescent staff who are holding a small boy. As tears rush down his face, Abo Mohamed grabs his two-year-old son Reda and frantically kisses his face. Reda holds on tight, looking a little stunned by all the attention. The Syrian father and son have been reunited after six long months apart. The pair were separated during an incident in which Reda’s mother and sister died. There are hundreds of thousands of people who, unlike Reda, remain missing due to armed conflict, disaster or migration. The impact of this on families is enormous with people like Abo Mohamed waiting months, sometimes years, for news of their loved ones. International Day of the Disappeared is a commemorative day that falls on 30 August each year to acknowledge these families and those who remain missing. Abo and Reda’s reunion has been facilitated by the Turkish Red Crescent Society and the Syrian Arab Red Crescent as part of the Restoring Family Links programme. Every year the Red Cross and Red Crescent Movement helps families re-establish contact with their loved ones through the services this programme provides. Separation from loved ones can be immensely painful for families. New Zealand is one of 191 countries where Restoring Family Links services are provided. The worldwide Red Cross network is utilised to help families restore and maintain contact and help families find out the fate of loved ones who have been reported missing. Similar to Abo and Reda, many families may find themselves separated by armed conflict and approach Red Cross for help. Here in Aotearoa, the international tracing service is the most utlilised aspect of the Restoring Family Links programme, helping family members find each other if they’ve been separated by armed conflict, disaster or migration. Enquiries to this service can range from current conflicts, such as the Syria crisis, to conflicts as far back as World War II. While their mother never talked much about her experiences during the war, Maria and her sister wondered what had happened to their parents’ families. Maria, on behalf of her sister and family, approached New Zealand Red Cross in 2011 to try and locate them. “It is not unusual for family members from the next generation to approach us wanting to know what happened to their extended family overseas,” explains Miriam. New Zealand Red Cross sent off the information they had about Maria’s family to the Polish and Ukrainian Red Cross Societies. The Polish Red Cross responded in 2012 saying they were not able to locate any family members. However, there was a breakthrough in the case this year and the Ukrainian Red Cross got in touch to say they’d located a 92-year-old aunt who Maria and her family weren’t aware existed. The case isn’t quite closed though with Red Cross still searching for family members from her father’s side. Meanwhile, Maria’s information has been passed onto her family members in Ukraine so they can make contact with each other. If you've been separated and lost contact with a loved one due to armed conflict, disaster or migration, get in touch with our Restoring Family Links team by emailing familylinks@redcross.org.nz to see if we can help. You can find more information on this service here.